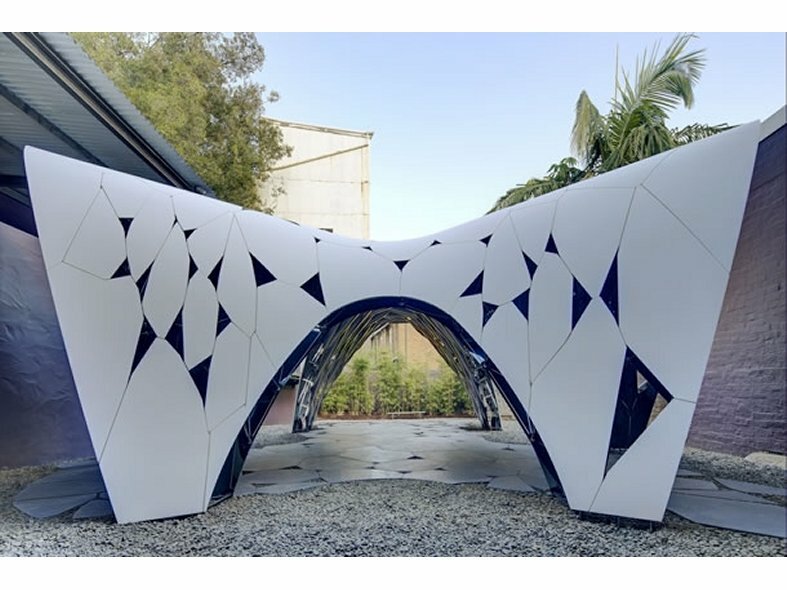 Australian architects AR-MA chose the winning combination of robot-aided production and the innovative, seamless solid surface Corian® to form the winning entry for the second year of the Fugitive Structures competition run by the Sherman Contemporary Art Foundation. The Fugitive Structures competition is open to emerging architects to design and create a structure that uses the very latest technologies. 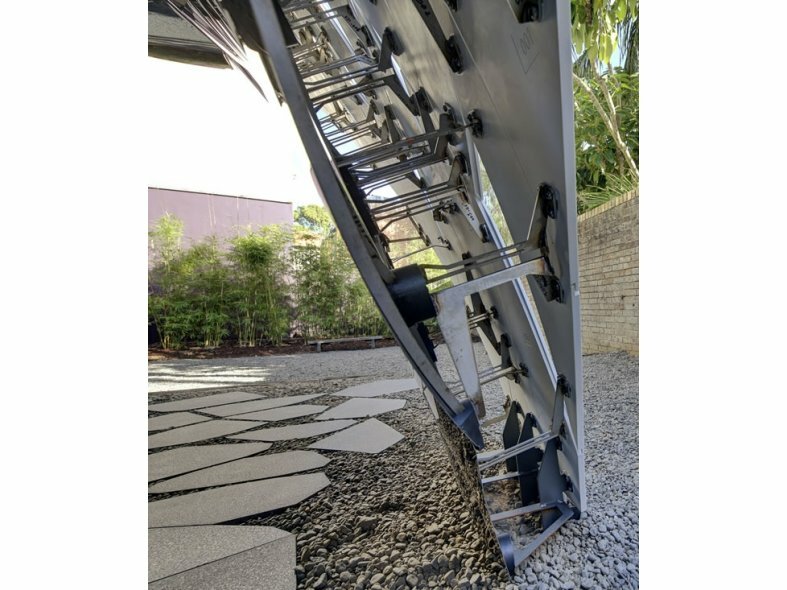 Fusing hundreds of exterior Corian® panels with black mirrors by using a series of intricate components, Trifolium is a weatherproof, futuristic pavillion that is guaranteed to stand the test of time in the zen garden at the foundation's gallery in Sydney, Australia. Named after its three-pronged design, Trifolium creates a canopy that can be used as an auditorium or a stage for events or even a meeting place. Trifolium's outside is constructed from 152 Corian® panels, with each panel fixed to a corresponding piece of curved black mirror-polished stainless steel using 452 unique steel brackets. The stunning effect is an intricate web-like joining that distorts your view, depending on the angle you view the structure from. 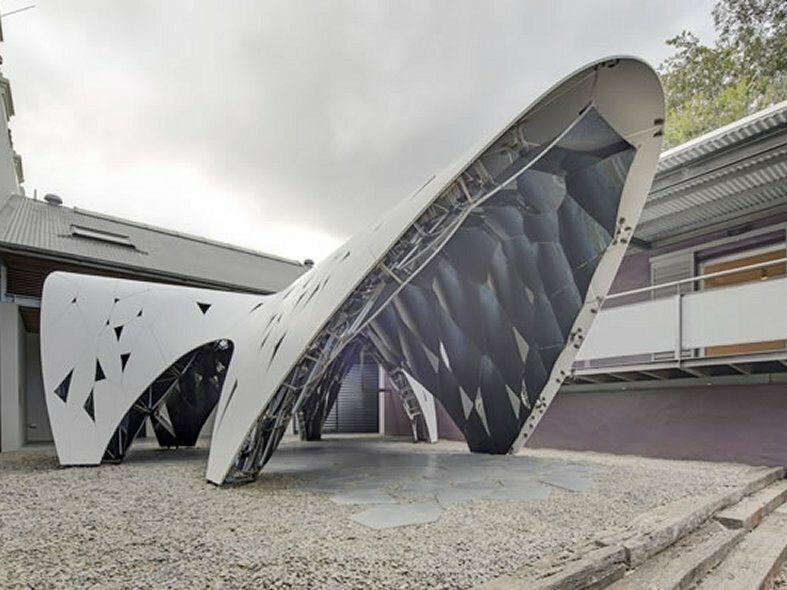 AR-MA used structural analysis software to monitor the stiffness and strength of the materials and components for this beautiful self-standing structure. All the parts were fabricated and produced off-site and then assembled over eight days, providing extra efficiency and reducing waste on site. The Corian® panels were built around scaffolding producing a sealed, watertight surface before the inside was assembled beneath the panels. The shelter can be used day and night, with recessed fibre optic cables laid in the concrete flooring providing intricate patterned light reflected by the mirrors within. AR-MA's director, Robert Beson, revealed of their winning design: "There are thousands of components and each one is unique. The only common elements are the bolts and screws that hold it together, so really it's a logistical project of tracking and managing all of the information and material." The judges branded the canopy "an innovative structure based on state-of-the-art technologies offering functionality as well as a futuristic aesthetic."